This large, charismatic apartment is a perfect place from which to explore Slovenian’s impressive capital. It is situated in the heart of Ljubljana in a traditional old building from the 19th century, on Židovska ulica by the river Ljubljanica, just a few steps away from Triple bridges and Prešeren square. Apartment is on the 1st floor with no elevator access. The central space of apartment is spacious living room with dining area, with exposed wooden ceiling and a pillar and with the view on the river and castle. There is a large, massive table room and three comfortable sofas, from which one falls down to a bed (150 x 190 cm), piano and LCD TV. From the dining room we enter to new, modern equipped kitchen with big refrigerator, stove, oven, dish washer, cooking utensils and cutlery, toaster, coffee machine. From the kitchen we proceed to the bedroom with double bed (180 x 200 cm). Beside the kitchen there is a small toilette with sink. 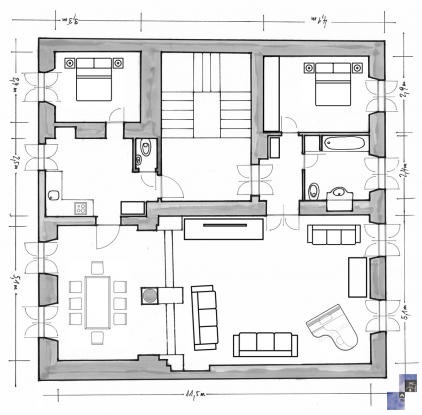 In the other part of apartment there is a smaller entrance hall, bathroom with bath tub, sink, toilette and washing machine and another bedroom with double bed (160 x 200cm) and spacious wardrobe. Apartment is equipped with iron, ironing board, hair dryer, CATV, Wi-Fi internet access. Towels and linen are provided.